"What are the best kids microscopes?" What is the best microscope for kids is a question we get asked a lot here at Microscope Detective, and for good reason. The right microscope can be an amazing purchase for a child, opening up a fascinating new world and engendering a lifelong love of science. The wrong microscope can lead to frustration, disappointment, and wasted dollars. 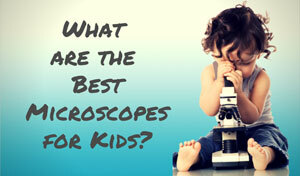 We took a look at a multitude of first kids microscopes in order to find the highest quality models at the best price. The winners all had a few things in common: they were durable, they provided good images, and they included lots of fun accessories that added greater depth and intrigue for a budding scientist. Every model on here is below $150, so you can spark a kid's imagination without blowing your budget. Sure it's necessary to consider the cost, and we don't think you need to break the bank, but the below criteria are also important for a fun learning experience with your child. Optics and Image Quality - Of course we're not going for graduate-level biological microscope images here, but a clear, sharp picture is very important. A decent image where you can make out details is fun and engaging, while a blurry, poor image is just boring. Quality optics are essential for keeping a young mind interested. Ease of Use - Nothing is more frustrating than a long-winded manual and a complicated instrument. Is it easy to turn on, focus, and change slides? A good kids microscope needs to be simple enough to use while still being involved enough to make your child feel like the mad scientist that he or she is. Hardware Construction - Any instrument in the hands of an active kid is going to take a beating. 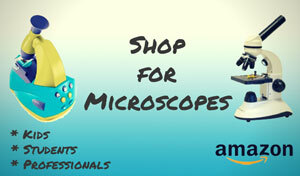 Thus good microscopes for kids should be sturdy, durable, easy to clean, and simple to store. Included Materials - Microscopes are the most fun when they include projects to get you started. Does the model come with prepared slides, an instruction book with suggested experiments, or software to manipulate images? The right materials can encourage a kid to create their own experiments, and take pressure off the parent to make things interesting. Customer Service - Quality customer service from a decent company is a nice touch and helps you avoid future frustrations. Is there a phone number or email address to contact in case something goes wrong? How about a return policy or a warranty? It definitely pays to know these things before you commit to buying a microscope for your kids. To make your life easier we've taken all these factors, including price, into account to present you with the best kids microscopes. The My First Lab Duo-Scope Microscope from C&A Scientific is hard to beat in terms of features, cost, and quality. It's inexpensive yet durable, and yields a quality image. The Duo Scope has two modes: compound (for specimens on slides) and stereo (for viewing 3D objects). So it's really two microscopes in one. This is a good purchase for an entry-level microscope, as you can nurture scientific interest without a large expense. The accessories make the experience even more creative, helping your kids learn while still remaining fun. The Tk2 Scope from Thames & Kosmos is another nice model that offers quality construction at a nice price. 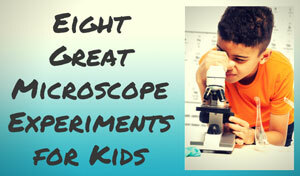 This powerful and sturdy kids microscope can provide years of fascinating observations. The quality of the microscope itself makes the Tk2 Scope a great buy with a solid reputation. It's a wonderful choice for teachers or parents who are home schooling. This model is rated very highly by consumers, and can stand up to a child's abuse while providing years of fascinating fun for young minds. We loved how this product encourages kids to make their own slides and experiments. That's not hard to do with 81 included accessories. If you want an under $50 option for children age 7 to 12, then the Amscope-kids beginner microscope is a good entry level choice. It has magnifcation up to 1200x and comes in with an 52 piece kit. This beginner microscope is great for the price and works well. The microscope is metal with plastic parts. Dont' expect super high clarity, but for elementary kids it is perfect. The builti in battery powered light works well when illuminating samples. Built in color filteres also help to improve viewability. All provided slide preparation tools are plastic, but are good enough to do simple tasks such as slide preparation. The includion of brine and shrimp eggs made for a nice touch and some excitement. No matter which kids microscope you choose, be sure to take the time to research carefully and read plenty of reviews. 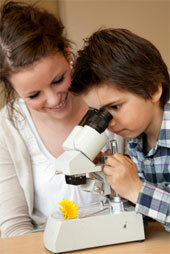 Remember that a quality kids microscope is more than just a toy, it's an investment in a child's imagination! The National Geographic Dual LED Student Microscope is a good option for parents looking for a complete kit for a 6 to 10 year old. 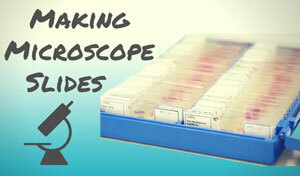 The kit includes up to 50x magnification and 10 prepared slides of biological specimins. It also has an interesting brine shrimp experiement that children will love along with some blank slides for home experiments. It is made out of hard plastic and has adjustable eye pieces. The microscope requires 2 AA batteries ,has two light sources and includes a coarse focus knob. In all there are 50 accessories, providng a nice value for a $70 toy microscope. The only criticism of the unit is a light source that might be too bright to view some specimins. If your child is curious and enjoys lookiing at things found outside then this is the perfect unit. Note that if you want to view cells, you would need a higher powered microscope that offers at least 400x. View more toy microscope reviews for the National Geographic Dual LED Student Microscope. Looking for more resources? The below pages have more articles and reviews on first microscopes. All reviews have a rating of 3.5 stars or higher on Amazon.com. The QX5 Digital Blue microscope also offers hours of educational fun by allowing you to see and manipulate images on a computer. 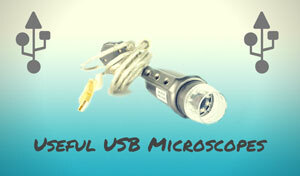 Read the full review of this kids USB microscope here. The EyeClops Bionic Eye effectively blurs the line between fun toy and educational tool. All one has to do is plug it into a television, turn it on, and get ready to view household objects at up to 200x magnification. Looking for a microscope for the under 8 crowd? The GeoSafari first microscope from Educational Insights is a popular choice. It makes a nice intro to science for younger kids, but may not hold your child's interest. Find out why here.